If you’re interested in getting involved in the community, check back often for updated events around the country dedicated to raising awareness, discussing the latest in research and more. 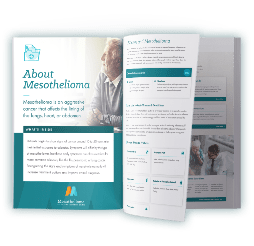 Getting involved in a mesothelioma or other related event is a great way to show your support for the cause, connect with others and raise awareness. Learn more about events that you or a loved one may be interested in below. The American Institute for Cancer Research (AICR) designated the month of February to raising awareness of how people can lower their risk of developing cancer, including eating better and exercising more. World cancer day aims to bring everyone together in support of those battling cancer, while also encouraging the government to continue pushing for a cure. This event also draws attention to the high frequency of cancer deaths in developing countries. Held on the last day of February each year, Rare Disease Day raises support and awareness for over 7,000 rare diseases and disorders, including mesothelioma, that affect around 30 million Americans. As of today, 95% of rare diseases don’t have any available treatments, stressing the importance of research. This multi-day symposium is hosted by the Mesothelioma Applied Research Foundation and brings together doctors, researchers, patients and other members of the mesothelioma community to discuss advancements, successes and new research around the disease. The organization has provided funding for over 100 studies thus far through their research grant program. Around the country, events will branch off of this day for groups to show their support for raising awareness, money for research and much more. Awareness is crucial to helping people understand mesothelioma and push for change to ban the known carcinogen, asbestos. Homes, buildings and schools are continuing to put people at risk for developing asbestos-related diseases. This year marks the 14th annual Mesothelioma Awareness Day. Bringing together patients, survivors, loved ones, supporters, doctors and organizations, this day highlights the disease and emphasizes the need to ban asbestos. Join the cause, look at events held around the country, not just on this day, but throughout the year to push for an asbestos ban and cure for mesothelioma. Page last modified on November 13, 2018.